Annual home price growth was 6 percent in July, according to the latest S&P CoreLogic Case-Shiller National Home Price NSA Index, released Tuesday. While that would seem to bode well for homeowners, annual appreciation actually was higher the month before, at 6.2 percent. That means price growth is indeed slowing, as observed yesterday by Redfin. S&P Dow Jones Indices Managing Editor and Chairman of the Index Committee, David M. Blitzer says the slowdown can be seen across the country, as sales of single-family homes have dwindled over the past year. Despite a gain in housing starts, housing affordability has continued to decline, he said. 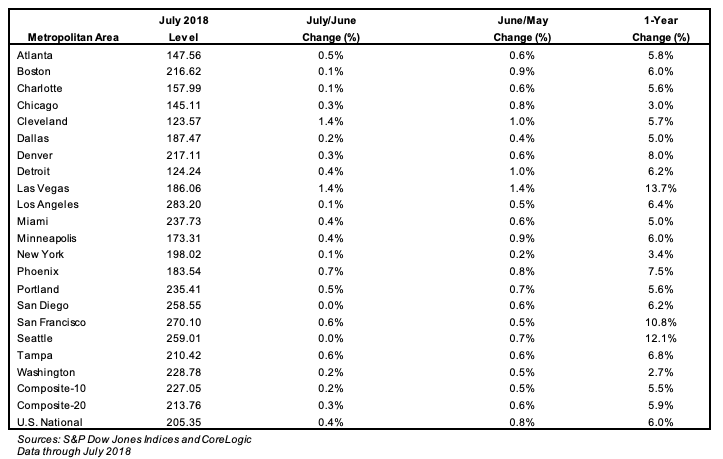 Regionally, Las Vegas, Seattle, and San Francisco reported the highest year-over-year gains among the 20 cities tracked by the index. Las Vegas saw a 13.7 percent gain, Seattle saw a 12.1 percent increase and San Francisco saw a 10.8 percent increase. Is the next housing market downturn on the horizon?